At the commemorative ceremony of the 120th anniversary of diplomatic ties between Greece and Japan on the 14th of January, we had a very impressive opportunity to celebrate and acknowledge the historical exchanges back to 1300 years ago in the form of art whose Hellenistic influences can be evidently seen in Buddhist heritage of Nara’s Todai-ji Temple. Following speeches by the honourable Deputy Foreign Minister of Greece, Prof. George Katrougalos and Mrs. Aikaterini Dellaprta, Director of the Byzantine and Christian Museum; His Excellency, the Ambassador of Japan to Greece, Mr. Yasuhiro Shimizu praised this exhibition as the ideal event to kick-off the 120th anniversary of bilateral diplomatic ties between both countries. 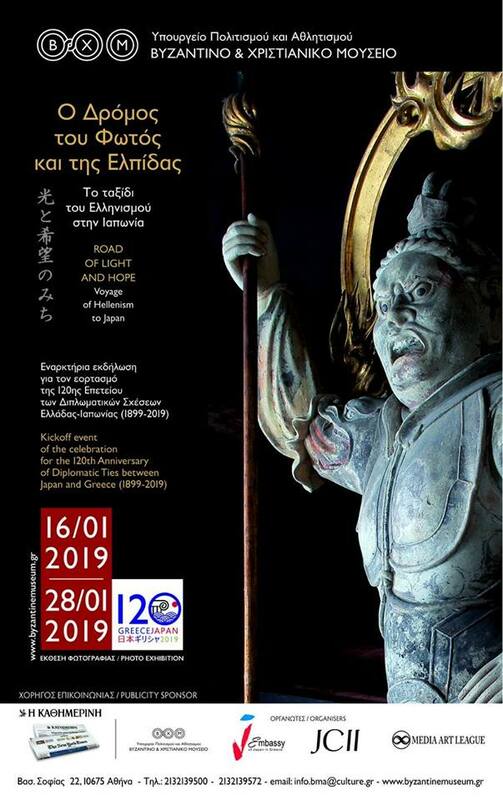 It is a great honour and a blessing for us to be able to send out a message that acknowledges and celebrates the unity of hearts between the peoples of Greece and Japan, through our exhibition, Road of Light and Hope —-with our modest tribute —in the form of art— to the great legacy of Alexandros lll with his truly cosmopolitan visions of the world as ONE! The exhibition will run from 16th January – 10th February and the 29th January, we will hold a lecture (in English) at the Museum from 7:30 PM.